We offer the markets best greenhouse automatic vents. J. Orbesen Teknik ApS has made automatic vents for more than 30 years, and are the world’s leading manufacturer of automatic vents. In our wide selection of automatic vents you will surely be able to find your perfect greenhouse automatic vents. Listed below are a few of our innovative automatic vents. Please allow yourself to take a tour on our website for more information on these fantastic automatic vents. Furthermore the website shows high quality pictures of all our products. Of course you are welcome to give us a call if you have any questions about our automatic vents or automatic vents in general. 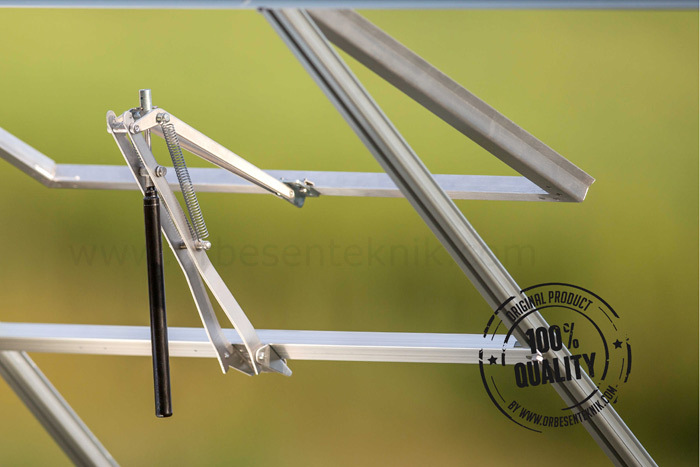 Ventomax® window openers are slender and powerful automatic vents for greenhouses. Ventomax® are popular high quality automatic vents with a long durability and is based on our well-proven standard hydraulic cylinder. The unique design of Ventomax® automatic vents keeps the hydraulic cylinder inside the greenhouse at all times, no matter the position of the window. Due to this important feature, these automatic vents will always react on the temperature inside the greenhouse. The Univent® window opener is a one of our most compact and powerful automatic vents. It uses our widely used and well-proven standard hydraulic cylinder that throughout many years on the market has proven its high quality and durability. No tools or difficult procedures are required. You simply clip off one end of the arm and you have access through the sliding door or into your cold frame – even with the door or roof closed due to the single-acting hydraulic cylinder. Simply open and clip off the arm.